Not as if you needed any reason to get your potentiometers cleaned beforefor Synth Fest, Paul Barry Clark in rotation as adopt-a-highway, continues to push the definition of local music provocateur to new peaks. He will continue his string of mayhem on day 2, embedding a local stop of his summer tour with Dead Pawn. He puts together shows across genres in a way you might think he was a raving lunatic. Quite contrary, he brings a controlled methodical rage to his gear, a rounded set of digital instruments, summoning conventional upright or electric bass. Mid-lining a weekend diy show at Cactus Club in June, adopt-a-highway went to the root and surfed various sound spectrum around that theme, blending break beat style sequences with improvised in-key modulated distortion. That night he brought up Nicholas Elert and B’More, MD origination Holy Circle. Both notable for pushing the synth genre. Slowly tearing through your scars, Holy Circle stays curled in a ball of raw inner turmoil. What Milwaukee gives on any given night at a show with not more than a pack of bodies, still unreal. Synth Fest lurks upon us until July 21st ans 22nd, Cactus gives it a home again. 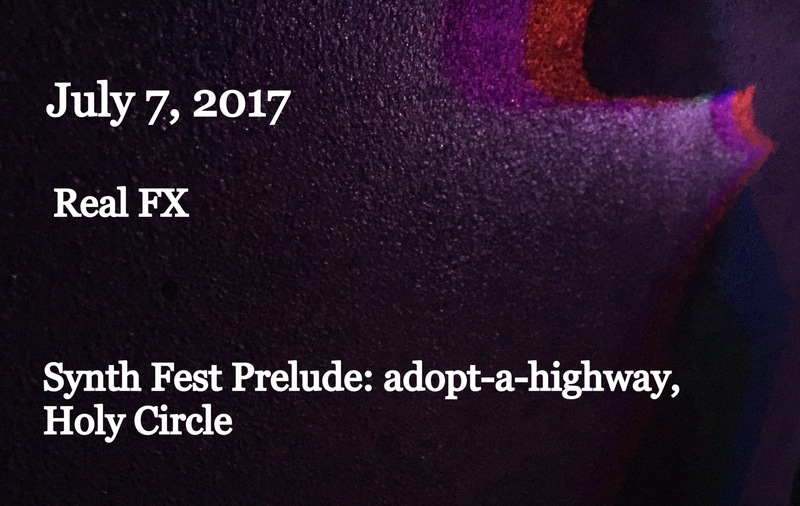 adopt-a-highway jumps up again on Saturday the 22nd, surrounded by a brood of synths styles. This entry was posted on July 6, 2017 by L.S. Trolley. It was filed under Local Trolley .